Written by Melissa Pellicci of Jupiter, Florida and lavishly illustrated by Alexandra Zgondea of Codlea, Romania, Best Friends Forest is a whimsical tale that reflects a world where it is possible to live in playfulness with nature, to be best friends with those dramatically different from us, and to experience daily the eternal and joyful embrace of Mama Earth and her Guardian Angels. Ms.Pellicci and Ms. Zgondea met while on a personal development retreat in Peru. They discovered their mutual desire to improve the world through children’s storytelling, and Best Friends Forest is the result of a two-year, long-distance collaboration. Author Melissa Pellicci says that in her decades of work as a life coach and yoga teacher, she has discovered that most of us learn to stop trusting and believing in the positive nature of the world as children, and this brings us much anxiety, illness, and personal difficulty as adults. If we could just keep our sense of wonder with nature and believe that the Universe is smiling on us no matter what, we would go a long way to make the world a safer kinder place, says Ms. Pellicci. I want the story and images of Best Friends Forest to live in the minds of both children and adults reassuring us that through love and nature, everything indeed will always be alright.” The illustrations by Alexandra Zgondea are remarkable in their colorful commitment to showing a world that smiles on Lourdres, the book’s ten-year old, golden-haired narrator. The trees and flowers have faces” that brighten the pages of the book, the colors soothe, and the characters are infused with charming appeal. Ms. Zgodea says, In Romania, nature is our life teacher. It shows us how to live effortlessly and grow up gracefully. Mother Earth is our anti-depressant. As a new mother to a young son, I want him to see a path to happiness and feeling safe with a book like Best Friends Forest.” The book’s roster of characters include a talking cat Spirit, a flute-playing spider Cappuccino, a guardian angel J, and a beautiful African-inspired Mama Earth who provides the safe and caring ground our Best Friends walk on. Best Friends Forest is available in softcover for $19.99 and hardcover at $29.99. Melissa Pellicci is a nutrition and diet expert as well a trained yoga therapist. Melissa says that in her decades of work as a life coach and yoga teacher, she discovered that most us learn to stop trusting and believing in the positive nature of the world as children and this produces anxiety, unhappiness, and illness in us as adults. 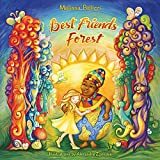 Melissa Pellicci wrote Best Friends Forest to help children keep their sense of wonder with nature and belief that the Universe smiles on us no matter what the circumstance. She resides in Jupiter, Florida.